Summary: After trained examiners and accomplished business professionals performed a thorough assessment of this work, Norbert Majerus has been selected as recipient of an internationally recognized award from the Shingo Institute, part of the Jon M. Huntsman School of Business. The author will receive the award at the 28th International Shingo Conference occurring April 25-29, 2016 in Washington DC. LOGAN, Utah — The Shingo Institute, part of the Jon M. Huntsman School of Business at Utah State University, has awarded Norbert Majerus with the Shingo Research and Professional Publication Award for his book, “Lean-Driven Innovation: Powering Product Development at The Goodyear Tire & Rubber Company.” Majerus is Goodyear’s lean champion in research and development. Lean methods typically have been applied to production processes in manufacturing companies, but they have had little success in product development. In 2005, Goodyear embarked on a major initiative to transform its innovation processes by learning, understanding, and applying lean product development principles. “Lean-Driven Innovation” tells the story of Goodyear’s lean R&D transformation, incorporates the voices of real people within the company, highlights real events along the tire maker’s decade-long lean innovation journey, and shares both the challenges and achievements. None of the improvement initiatives Goodyear launched in the past 20 years has impacted R&D and the entire company as much as lean. 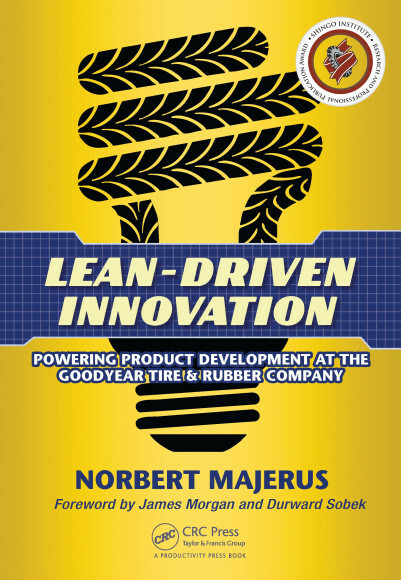 In describing the lean principles that Goodyear validated during its R&D transformation, the book presents a roadmap for how readers can leverage lean to successfully transform innovation processes in their own companies. Readers will gain a practical path for applying lean to the innovation processes of their organization, including where to begin and what to do, regardless of the industry and status of the transformation. Majerus will receive the award during the Awards Gala of the 28th International Shingo Conference in Washington D.C. The conference is a five-day event featuring a selection of workshops, plant tours, keynote speakers and breakout sessions designed to provide ongoing knowledge, insights and experience for organizations in pursuit of operational excellence.